1. Scoop the ice cream into bitesize spoonfuls and mix with the meringue and raspberries in a bowl. 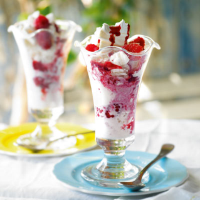 Spoon into 2 sundae glasses and drizzle over the raspberry coulis. Serve immediately.